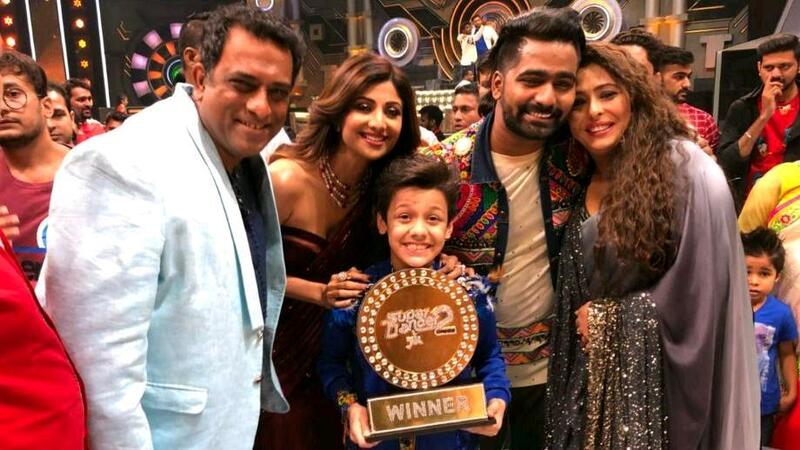 Super Dancer 2 2018 finale: Shilpa Shetty, Geeta Kapur, Anurag Basu and Bishal Sharma poses after winning the show. Sony Entertainment Television’s famous dance reality show Super Dancer 2 finally came to an end on Saturday night at around 11.30 pm. The four finalists of the show Ritik Diwaker, Akash Thapa Vaishnavi Prajapati and Bishal Sharma danced their hearts but it was Ritik who walked away with Rs 15 lacs and the coveted trophy. Bollywood actor Varun Dhawan has also came to the finale to promot his upcoming film October during the show. Wile during the show he also dance with judge Shilpa Shetty, which got the audience cheering for them. While the finale also saw actor Shilpa grooving to some peppy numbers & showing off her belly dance moves, Geeta in a breathtaking act paid a special tribute to yesteryear heroines. The 3 super judges Shilpa, Anurag and Geeta give their verdict on the dance performances of the finalists for the last time in this season of the show. Both Geeta & Shilpa get emotional while giving comments. Finally super judges announced the winner at 11.25 pm. The winner with one 1 cr and 20 lakhs votes is Bishal Sharma.